JIM SKILES is one of the original founding members of the Wisconsin Coalition of Annuitants. 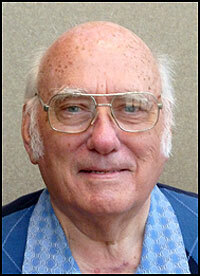 He retired from the University of Wisconsin-Madison in 1989 as Professor Emeritus of Electrical and Computer Engineering, after 38 years of service. During his career, JIm was Wisconsin Electric Utilities Professor of Energy Engineering, Director of the University-Industry Research Program, Director of the College of Engineering Energy Research Center, and Chairman of his Department. He and his wife of 63 years, Deloris, are natives of St. Louis and moved to Madison in 1951. They have three sons. In 1991, they had a house built on a 3-1/2 acre wooded plot in a rural area overlooking a large marsh near Riley. Deer, wild turkey, raccoons and a large variety of birds are seen in their yards almost daily. A pilot for 55 years, Jim is licensed as an instrument rated Commercial Pilot, with land and seaplane ratings, and owned airplanes for 25 years. His wife is a private pilot and one son is an airline pilot. They flew all over the US and Canada in their planes, including 6 flights to and around Alaska. Jim enjoys travel and has visited all 50 states, all Canadian Provinces and Territories, except Newfoundland, and has been in 52 countries. He has a special interest in the Polar regions, with trips to Alaska, the Siberian arctic, Greenland and Antarctica. In his younger days, he enjoyed downhill skiing and canoed and backpacked in wilderness areas of Alaska, Ontario and the Northwest Territories of Canada.